NAMM 2014: Another short, but sweet announcement from the Fender folks - the firm has debuted a durable-looking passive volume pedal, dubbed the FVP-1. See what it's got to say about it on the press release below. The Fender FVP-1 pedal is a passive volume foot pedal designed for guitar and bass. The rocker-style pedal controls volume using a passive 250k potentiometer with a high-life cycle for reliable, quiet operation. Tone is maintained at any volume, and the special tone circuit retains high-end clarity as volume is reduced without becoming dark or muddy. 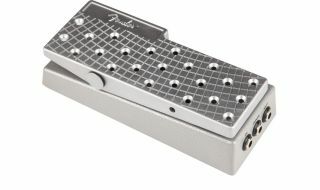 The input, output and tuner jacks are located on the front panel for easy access, and the tuner jack allows silent tuning during live performances. The pedal motion is smooth and predictable with user-adjustable resistance. With valuable space at a premium on most pedal boards, the FVP-1 is compact enough to make an efficient and conveniently sized addition. Its base and pedal are made of heavy-duty die-cast aluminum with a durable hammertone powder-coat finish on the base. No batteries or other power sources are required.